I got these two beautiful plants for my shade garden from the award-winning horticulturist and specialist plant grower Jim Holmes (whom you might remember I met at the Rare Plant Fair two weeks ago). Jim specialises in unusual and rare plants and has a collection of plants that simply amazes! I’ll have to save up now if I want anymore plants from him – they are not cheap. 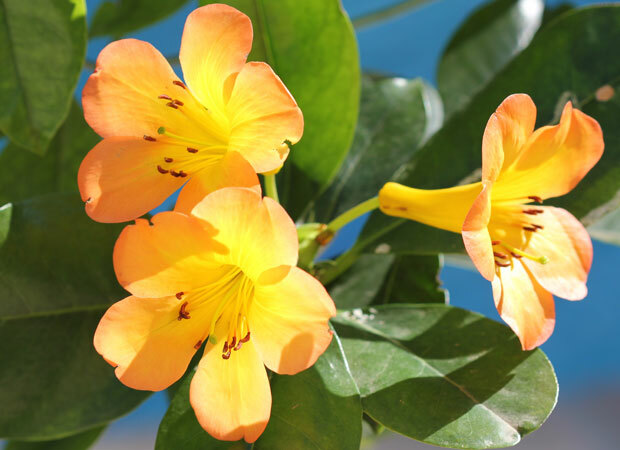 Clivias, for example, take three to four years to flower. They cannot be propagated from tissue so all Clivias need to be hand pollinated when breeding your own. So when a specialist grower pollinates to produce an unusual colour (eg. the near whites and yellow Clivia’s Jim is well known for), they have to produce up to 100 plants of which very few will be the rare colour types – and it takes 3-4 years before they know which of the 100 plants they have grown will have produced a rare colour as it takes that long for them to flower for the first time. (I hope I’ve explained this correctly – I have written it the way I understood it). It was very interesting learning about this today. 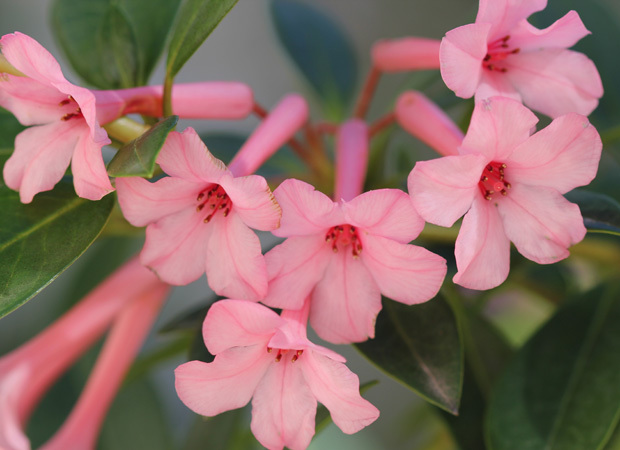 If you are interested in Vireya Rhododendrons see the website at http://www.vireya.net and while you are surfing around, stop over to admire more eye-candilicious blooms at “Blooming Friday – Eye Candy“! Wow wow! These are so stunning. And the colours! Perfect for your garden. Going to be the best show on the Blooming Friday!!! Both are so beautiful! I have one rhododendron in my woodland garden. I planted it in late winter and am waiting to see if it will survive and will it bloom. No chance for a rare color; just a common pink, but I have never had a rhodie survive my summer, although its cousin azalea grows well here. Hopefully, I have sited this one for success. Good luck with yours! Wow, I’ve never seen such a beautiful color on a rhododendron! I wish our rhododendrons here in the U.S. looked like that. I’m sure they will thrive in your garden! Such beautiful blooms with vibrant colours! You are right! These are definitely eye candies. Those are so pretty! Finally, we have purple and white iris popping up and our grapes are taking off. I cannot wait! Very pretty! I see why you’re so proud to show them off! Hi Holly, thank you! I’m immensely happy with them. I just hope I can keep them flowering and thriving like this. They are quite big plants already so I hope they like living in my garden.